A dental surgical procedure is a special procedure performed by the dentist or an oral surgeon either to treat diseases, correct oral conditions and improve the appearance of a patient’s smile. When the necessity is high, the procedure is deemed emergency so compromises can be made; but when the surgery can be deferred and is not at all necessary, the procedure is elective. Tooth Extraction: When a tooth is well beyond restoration and can no longer be saved through pulp therapy, it is removed from the socket and out of the mouth by a tooth extraction. Odontectomy: When a tooth is impacted and trapped under bone and soft tissue, it may no longer erupt in the mouth. An impacted tooth (often a third molar, but may also be a canine or any other tooth) is removed through dental surgery involving the incision of the gum, the removal of bone and the careful sectioning of the tooth. Crown Lengthening: To enlarge the appearance of the tooth’s crowns or to correct a gummy smile, a crown lengthening procedure is performed and this involves the careful scalloping reduction of the bone around the collars of the teeth, the repositioning of the gum tissue and the fabrication of prosthesis. Frenectomy: When the frenum is too low or much too high, it is severed from its attachment and strategically reattached. Gingivectomy: A gingivectomy procedure may be prescribed for different reasons but often they are indicated for the hyperplastic growth of gums caused by the gum disease and infection. 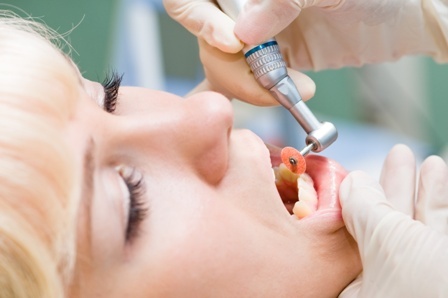 Dental Implant Placement: The installation of dental implants is a dental surgery procedure. It involves the drilling of bone and may or may not involve the reflection of the flap. Gum Surgery: When the gum condition of the patient is more severe and ordinary scaling and cleaning procedures can no longer address the problem, a more comprehensive gum surgery procedure may be indicated. This will involve the incision of gum tissue so that the roots and the deeper areas of the bone may be accessed, and it can include grafting of bone and soft tissue. Jaw Surgery: Jaw surgery may be indicated to address a fracture after an accident, to correct an orthodontic anomaly and to remove any pathology within the area. It is a complicated dental surgery procedure that is performed by a highly trained specialist, such as an oromaxillofacial surgeon. Surgical Removal of Pathology: When pathological growths are present in the mouth and antibiotic treatment and other medications failed to resolve the issue, the surgical removal of the pathology is the last resort. Some dental surgery procedures of this nature may be formed in the dental clinic, but more severe conditions should be done in a hospital setting. Surgical Treatment of Clefts: When the structures of the mouth did not develop and fuse as it should, clefts are formed. A cleft may be corrected by a series of surgical treatments, and they are performed by highly-skilled oral surgeons.